Be the first to share your favorite memory, photo or story of Marlow. This memorial page is dedicated for family, friends and future generations to celebrate the life of their loved one. 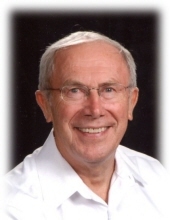 Marlow Remmers, 74, passed away Monday, November 26, 2018 in Des Moines. A funeral service will be held at Lutheran Church of Hope in West Des Moines on Monday December 3, 2018 at 11 a.m. with a visitation starting at 10 a.m. The following day a funeral service will be held at Christ Lutheran Church in Pickrell, NE on Tuesday, December 4, 2018 at 11 a.m. with a visitation starting at 10 a.m. Burial will take place at Christ Lutheran Church Cemetery. Marlow was born August 17, 1944 in Beatrice, NE to Jurgen and Fannie (Bauman) Remmers. After graduating from high school, he went on to Dana College and received his bachelor’s degree in Accounting. Marlow was very active in church and was a proud Alpha member, where he led prayer groups and never turned down an opportunity to help others. Marlow was very passionate about the ICM (International Cooperating Ministries) where he had the privilege of building churches in 3rd world countries. He truly was a selfless person and lived to give. Marlow excelled in athletics and enjoyed cheering on the Huskers. Left to cherish his memory is his son, Matthew; brother, Les (Deb) Remmers; and many extended family and friends. He was preceded in death by his parents, and two brothers, Orville and Darryl Remmers. To send flowers or a remembrance gift to the family of Marlow Gale Remmers, please visit our Tribute Store. "Email Address" would like to share the life celebration of Marlow Gale Remmers. Click on the "link" to go to share a favorite memory or leave a condolence message for the family.